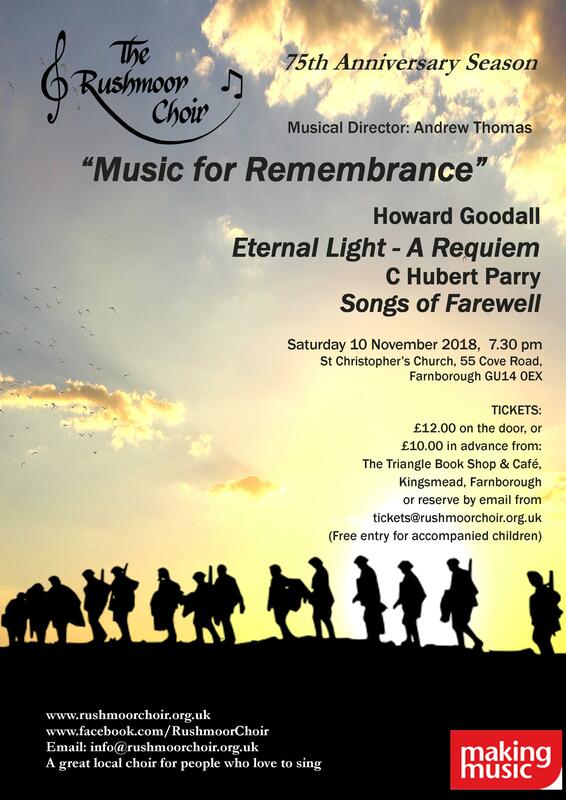 On Saturday 10 November 2018 Rushmoor Choir will be performing Howard Goodall’s Eternal Light (A Requiem). Howard Goodall is probably best known for his film and TV music, but he is also a composer of many classical works. First performed in 2008, Eternal Light mixes the traditional Requiem’s calls for peace, rest and light with words from English poetry. The result is a powerful expression of solace to the living for the appalling pain of loss and grief they bear. The work has become popular with choirs in the UK and abroad, but this will be the first performance in the Rushmoor area and it is exciting for us to mark the 100th anniversary of the end of World War I in this way. The concert will also feature two works written by Hubert Parry, who died in 1918. His early piece Blest Pair of Sirens, is a setting of Milton’s At a solemn Musick first performed at Queen Victoria’s Golden Jubilee concert. Songs of Farewell, written in 1916, are masterpieces of choral writing that express Parry’s beliefs as he watched, incredulously, the carnage of World War 1. If you would like to join us singing Eternal Light, Rehearsals start on Tuesday 4th September at 7:45 in St Christopher’s Church – see our Facebook event for details.